“Go, go, go!” Diogo yelled from somewhere behind the lineup. I put my head down and dug deep into the water with every paddle. I started to feel the familiar lift of the wave underneath and I suddenly noticed for the first time just how big this thing was. My heart sank. I slid down the face of the wave like a skater on a ramp. Digging my backside rail into the water, I looked over my shoulder in disbelief at the open face in front of me – a monster left-hand point break that must have been 12-15ft tall. Meanwhile, I – a fairly average, if not below average Texan surfer – had no business attempting to tame such a formidable beast. Here I was anyway, on the biggest wave of my life off the coast of Nicaragua. The real answer is the road there began one lazy, Sunday afternoon in my college dorm room. It was a frigid day in March and I was growing frustrated with the cold, rainy days. I decided then to buy a plane ticket for the end of that semester to somewhere warm, somewhere new, and somewhere I could surf. 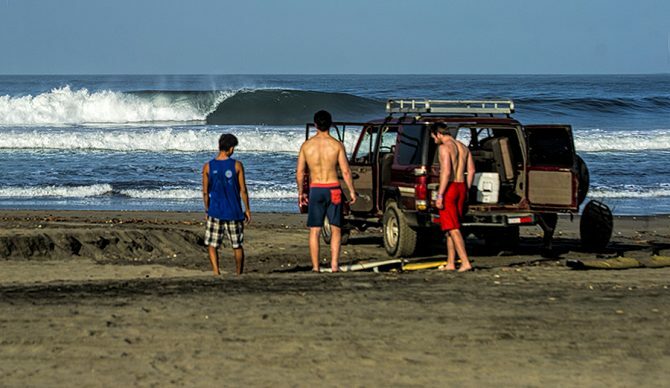 I chose Nicaragua and called my good friend, Keaton, to see if he was up for a bit of traveling. “Why not?” he said, nonchalantly. Two quick months later we were on a plane to Managua. As we stepped out of the Managua airport, the ink still wet on our fresh passport stamps, we were greeted by a jolly American named Jonathan, wearing board shorts and a Red Bull cap. And then there was Diogo, the Brazilian photographer with an eccentric personality and a knack for calling people out and pushing boundaries. We cracked open a few beers when we finally got to camp and started getting to know each other. Jonathan explained to us how he came from Boston to Nica, working at a bus stop, advertising hotels to tourists, and then finally opening up his own surf camp in Nicaragua. Keaton and I shared a business idea we had been floating around to each other, runnig a student travel company. The only issue was that neither of us had planned to become entrepreneurs after college. We were each on cookie cutter paths, chasing the ideals of success that had been laid out before us. Keaton was studying accounting and had started to interview for some pretty comfortable positions. I had my eye on law school. And of course, what could we offer that another student travel company couldn’t? What would separate us from the hundreds of other student travel programs out there? The night went on and admittedly, got a bit out of hand when we traded the beer for rum. Eventually, we all crept off to bed eager for the first morning of surf. The next day came and went with amazing waves. Both Keaton and I had our fair share and more importantly, we both had the chance to progress as surfers. Neither of us were exceptionally great surfers at the time. Keaton was just starting out and I was by no means an expert. We found ourselves paddling out to breaks that were way out of our league often. We would take a beating, but nothing we couldn’t handle. So when Jonathan mentioned that left point break that required a boat trip down the coast, we jumped at the opportunity and assured Jonathan we would be totally fine. We sluggishly got dressed in the dark and left the camp well before sunrise the next morning. We loaded our boards onto the small ceramic boat in the river and gently made our way down to the river mouth. The sun began to rise as we puttered our way into the Pacific Ocean. When the wave came into view, we could see another boat just behind the break and three surfers in the water. We dropped anchor and watched one surfer paddle for a wave. He didn’t make it, falling end over end down the face of the wave. Defeated, he paddled back to his boat on a board that had just been snapped clean in two. Keaton and I looked at each other, realizing it would be one long morning. Back to the present; I’ve finally made my way to the surface after navigating my hold down and am frantically swimming toward the boat, dragging my board behind me by its leash. Keaton had returned to the boat too, having taken a beating of his own. “Was it worth it?” Diogo quipped as he climbed onto the boat with a grin on his face. That night, Keaton and I talked more about starting our travel company. We had learned that day, out in the ocean, that there’s endless potential for travel to positively impact a young student. Every time we leave home we are pushed out of our comfort zones. We become a little more independent and we learn to communicate across language barriers. Sometimes the ocean hands out a beating, but in the end we grow a little more confident as a result. Editor’s Note: You can learn more about the author’s surf inspired study abroad program, Knowledge on the Run, here.